Robert Jamieson, the owner, is justifiably proud of his new digs. The beautiful colours on the walls show his priceless turtle collection off to perfection. 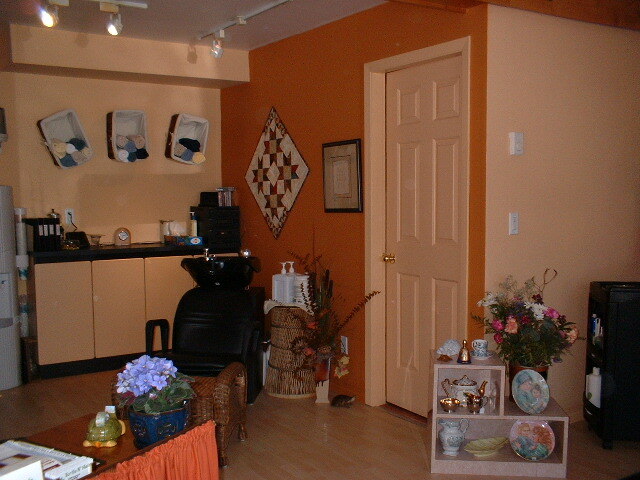 Robert is a well-known local haidresser who has been grooming folks in Sechelt since 1986. The history of Robert's fascination with turtles makes for some interesting reading, beginning with a summer vacation at Killarney Lake, Manitoba, when he was a lad of five. The backdrop of the lake was Turtle Mountain, which a family friend immortalized in a turtle made of clay soil and water from the lake. Although it is the only turtle Robert has lost over the years, that one small sculpture sparked a collection that continues to this day. 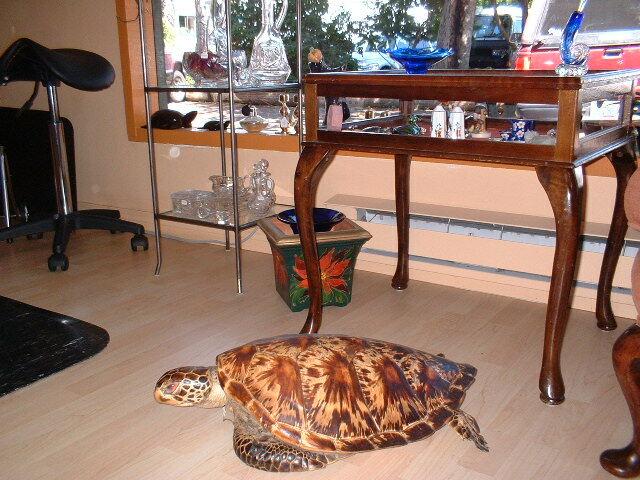 Robert has turtles made of everthing from precious metals to wood. Over the years his collection has grown to more than 1500 objects. Roberts clients delight in bringing him turtles from all over the world. One of his turtles is carved from rare fossilized coral from the ocean bottom north of Prince Rupert, signed by Vancouver artists George Pratt. Another is carved from a very large pecan nut from Springfield, Illinois. He has turtles fashioned from recycled garbage bags, pewter with inlaid god, hand-carved walnut from Germany, cloisonne from the French Riviera. As Robert so succinctly puts it, "I named my business Turtle for the collection; Hair for what I love tio do best for 38 years. His business combines the best of work and hobby. Make an appointment ot change your "shell" today. We also offer a variety of beautiful products from "The Front PORCH" store.